Darlington bantamweight Stu Hall says he is an improved fighter from June's defeat by Paul Butler that cost him the IBF world title. Butler, 25, immediately vacated the belt following the victory, and mandatory challenger Randy Caballero agreed to hand Hall a title chance. 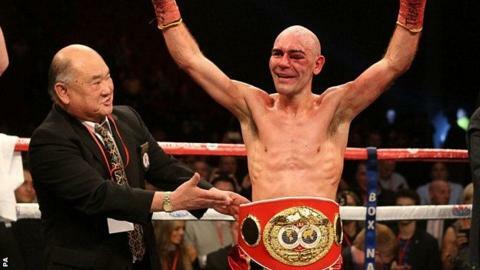 "Caballero will look at my last fight and maybe think he's in for an easy night," Hall told BBC Tees. "But there's a whole new Stuey Hall come the 25 October in Monte Carlo." Since his last fight, 34-year-old Hall has changed trainer and moved his camp to Birmingham. "I've got a new trainer in Paddy Lynch and Max McCracken and I'm training twice a day, every day. "I'm sparring four out of five days, I'm coming on loads, learning new things and it's revitalised me." The fight with 24-year-old Caballero was initially expected to take place in the north east, following bouts in Newcastle against Martin Ward and Butler. However, the event against the Californian fighter will be staged in Monaco, on the undercard of Martin Murray's WBC Silver middleweight title defence against Domenico Spada. "He's beaten 21 people so he's a definite threat," Hall said of Caballero. "He'll be full of confidence but in my eyes he hasn't fought anybody but I won't read too much into him."